A Temporary Traffic Regulation Order (TTRO) is to be made for the following locations: Melton Road, Rearsby and Chestnut Way, Broome Avenue, East Goscote (see attached plan). 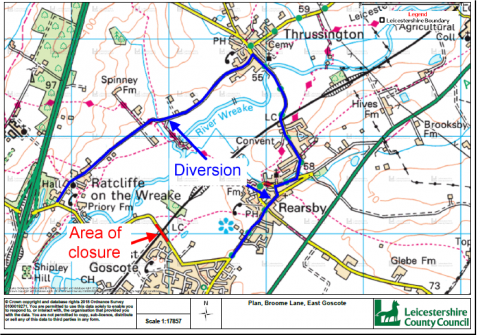 The purpose of the TTRO is to facilitate Leicestershire County Council with carriageway patching works. The TTRO will incorporate temporary road closures. Melton Road will be closed on 28th January 2019 for 1 day. Broome Avenue will be closed at its junction with Chestnut Way on 29th January 2019 for 1 day. Chestnut Way will be closed, in a South bound direction only (towards Melton Road), between Long Furrow and Melton Road on 29th January 2019 for 1 day. PCSO Matt Harbutt from Leicestershire Police, will be holding a local engagement meet and greet to give residents the chance to tell the local beat team any issues or concerns on the 25th of November at 12:00 on the Car Park by Clover walk. 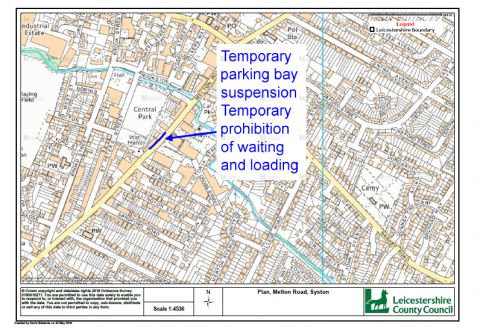 A temporary parking bay suspension and temporary prohibition of waiting and loading order was due on Melton Road from 16th July 2018 for 3 days. Due to unforeseen circumstances the works did not take place. The parking bays outside properties 1172 to 1190 will be suspended. During the works a ‘Temporary prohibition of waiting and loading’ order will be enforced within the suspended parking bays. Leicestershire County Council Highways has agreed to a Temporary Traffic Regulation Order. Glebe Way will be closed on the 6th August 2018 from Wanlip Road to Moorland Road. Wanlip Road will be closed on 6th August 2018 from Ryans Way to A46 for 1 day. A607 Slip Road will be closed on 6th August 2018 from the A607 to Wanlip Road for 1 day. College Road will be closed on 7th August 2018 from Goodes Lane to Barkby Road. Barkby Road will be closed on 8th August 2018 from Melton Road to Queniborough Road for 1 day. Fosseway will be closed on 16th September 2018 from Roman Way to Melton Road for 1 day. The Temporary Traffic Regulation Order will be implemented for public safety to allow Leicestershire County Council undertake carriageway patching works. 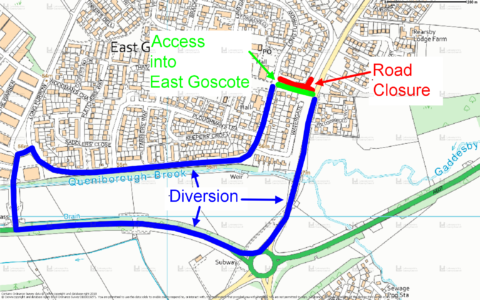 The proposed alternative diversion route will be signed on site. A temporary road closure is required on Broome Lane on 9th June 2018 for 1 night (21:00 hours till 09:00 hours). The road will be closed either side of the level crossing. The Temporary Traffic Regulation Order will be implemented for public safety to allow Network Rail undertake Switch renewal works on the level crossing. The proposed alternative diversion route will be via:- Main Street, Thrussington Road, Ratcliffe Road, Rearsby Road, Station Road, Brookside, Melton Road and vice versa.